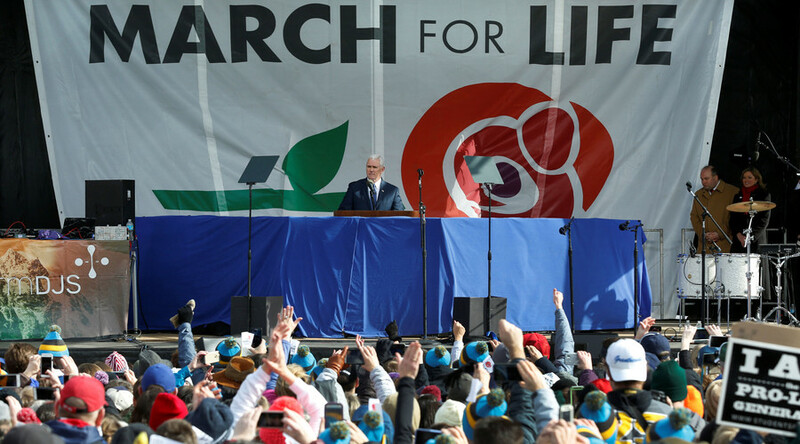 The annual march of abortion opponents received its most significant endorsements this year, with Vice President Mike Pence addressing the gathering and President Donald Trump tweeting support. “Life is winning again in America,” Pence, the highest-ranking elected official ever to address the march, told the crowd gathered under the Washington Monument on Friday. The March for Life has been held every year since the US Supreme Court ruled abortion was legal in the landmark 1973 Roe v. Wade decision. Pence is the first sitting vice president to address the march. “Our president is a man with broad shoulders and a big heart,” Pence told the marchers, adding that Trump will appoint a judge to the vacancy on the Supreme Court who would “uphold the God-given liberties enshrined in the Constitution.” The first of those liberties, Pence pointed out, was life. Trump was not at the march himself, but tweeted out a message of support earlier in the day. He is meeting with the British Prime Minister Theresa May, the first foreign leader to visit Washington since Trump’s inauguration. The vice-president told the cheering crowd that the Trump administration intended to cut federal funding to abortion providers and direct it to providers of healthcare for women. “We will not rest until we restore the culture of life in America for ourselves and our posterity,” Pence said. However, Pence also urged the marchers to champion their cause through love, compassion and gentleness, rather than anger or confrontation. “Compassion is overcoming convenience and hope is defeating despair,” he said. “We hear you. We see you,” Conway told the crowd. The annual March for Life usually takes place on January 22 to mark the anniversary of the 1973 Supreme Court decision, but this year it was put off due to Trump’s inauguration ceremony on January 20. Tensions over abortion in the US seem to be running high, with 47 percent of Americans saying they are pro-choice and 46 percent claiming they are pro-life, according to the latest Gallup survey. An inclination to either option usually differs by gender and age, the survey suggests. Women and younger men tend to stick with the pro-choice idea, while men and older people support the pro-life cause. Some 50 percent of Americans believe that abortion should be “legal only under certain circumstances” while 49 percent say it should be legal in all circumstances. Twenty-one percent believes it should be illegal in all circumstances. The March for Life follows a massive anti-Trump event dedicated to women’s rights – the Women's March that took place in Washington on Saturday. More than half a million people joined the rally, making it the largest demonstrations in the city’s history. The protesters, gathered with a viral post on Facebook, took to the streets to decry Trump’s policies, including on abortion. 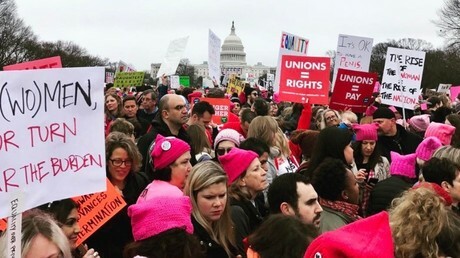 The so-called sister marches in solidarity with the Washington one were held in other US cities and around the globe.